Stress is the natural way for the body to respond to any demand or threat. Do you feel under pressure or in danger? Immediately, your adrenal glands release hormones like adrenaline and cortisol into your system. 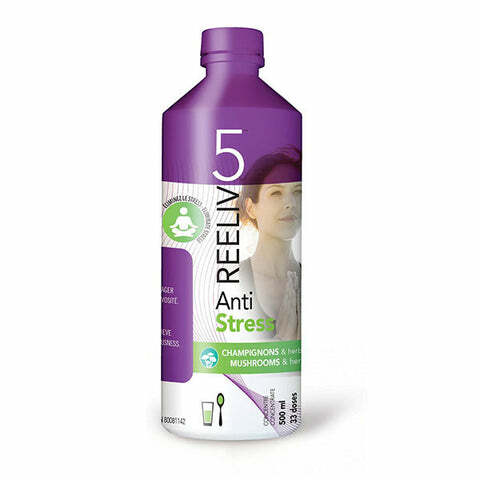 Reeliv5 Anti Stress, a unique blend of medicinal mushrooms and adaptogenic herbs, promotes psychological well-being and helps the body naturally combat the symptoms of stress. Briefly, it comes to the rescue of your adrenal glands! An ideal formula for those suffering from adrenal fatigue or other conditions caused by anxiety and chronic stress. Used as a nervine to help relieve nervousness. Very practical, it can be absorbed alone or mixed with another liquid. Non-medicinal ingredients: Purified water, vegetable glycerin, citric acid anhydrous, natural peach flavour, stevia, sodium benzoate, potassium sorbate. Helps to relieve symptoms of stress (such as mental fatigue and sensation of weakness). Traditionally used in Herbal Medicine as a nervine to help relieve nervousness, to relieve symptoms of stress (such as mental fatigue and sensation of weakness), as a source antioxidants and of fungal polysaccharides with immunomodulating properties. Consult a health care practitioner If symptoms persist or worsen, and If you are taking antidepressant medication, taking hormone replacement therapy (HRT) or birth control pills, have any type of acute infection, have exterior pathogens/conditions prior to use. Consumption with alcohol, other drugs or natural health products with sedative properties is not recommended . If you are pregnant or breastfeeding, do not use this product. If you are pregnant or breastfeeding, do not use this product. Shake well before using. Store in a cool dry place.